Live streaming is a great way to get people’s attention, especially in a competitive space like Facebook. With over 2 billion users, Facebook is definitely one of the best places to share your live videos. However, you need to find a way to stand out or you’ll become background noise. That’s no easy task. Here are a few tips on how to give your audience an amazing experience during your live stream. Having a software like ManyCam on your side during your Facebook live stream is crucial. It helps you tell your story in a compelling and professional way, with camera transitions, effects, and filters. Switch between live video, pre-recorded videos, your screen, still images, your mobile camera and much more. You can add up to 12 different sources and transition from one to another seamlessly. On ManyCam, before you start your live stream, make sure everything is prepared and ready to go. 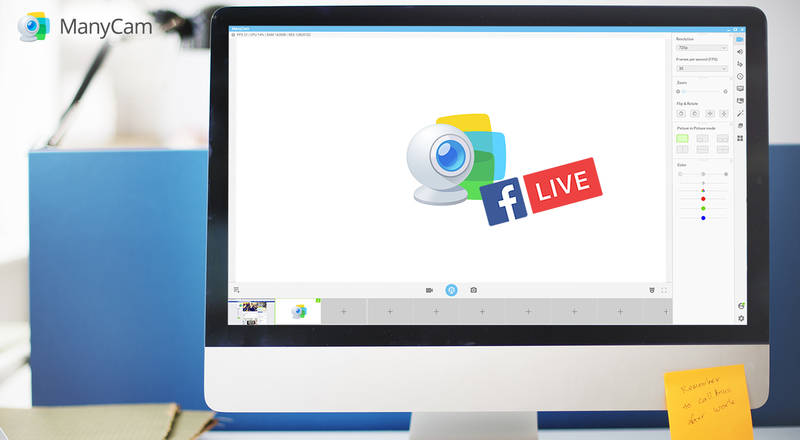 Add the various sources you’ll be using in your live video, like pre-recorded videos, images or a PowerPoint presentation, for example. Test all your sources. You can also set up your audio preferences, create a playlist for your live stream or simply use the audio from each video source. Once you’re ready to start live streaming, click on the broadcasting button. 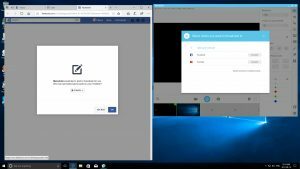 It gives you 3 options: add a custom channel, Facebook, and Youtube. You can connect with many different live stream platforms, and stream to more than one simultaneously if you want to reach more people. For the purpose of this example, we chose only Facebook, but you can choose as many as you’d like. ManyCam opens your default browser and if you are not logged in on your account, it will ask you to do so. 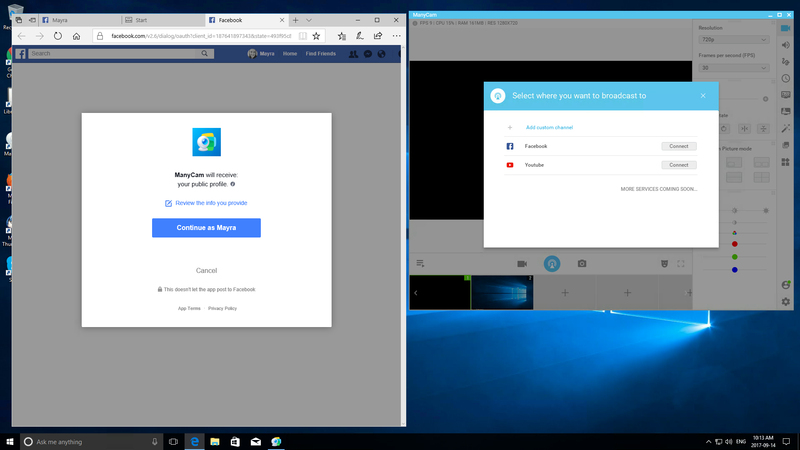 Then, Facebook asks you if you’d like to continue with the same profile and to allow ManyCam to post on your behalf. Here you can also choose who will be able to view your live stream, such as Friends, Friends of Friends, Public, etc. 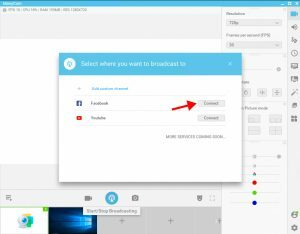 Important: Without this permission, you’ll not be able to share your broadcast on your page. After that, ManyCam notifies you that it’s ready and to go live, simply hit the OK button. This setup is only required for the first time you broadcast with ManyCam. 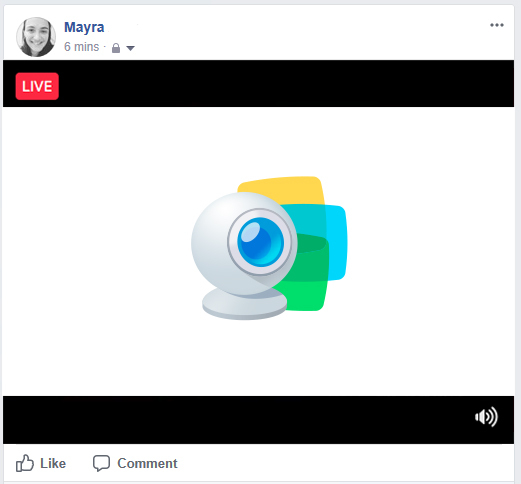 For the next live stream on Facebook with ManyCam, all you’ll have to do is click on the broadcast button, then click on connect to Facebook and your live video will begin. 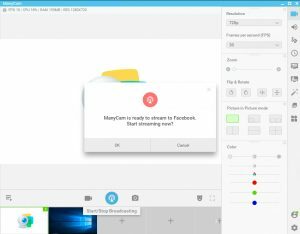 During your live stream, you can access all of ManyCam’s features, switch between video sources, images, and your screen, add effects or filters, put on a playlist and much more. Get ManyCam today and take your Facebook live streams to the next level! We are preparing a full checklist for live streaming, stay tuned!